A few weeks ago, the Preservation Services team used one of our regular department meetings to play a board game. Yes, that's right...we played a board game at work! But lest you think we're just a bunch of slackers, let me assure you that this particular game was special, and highly relevant to our jobs. 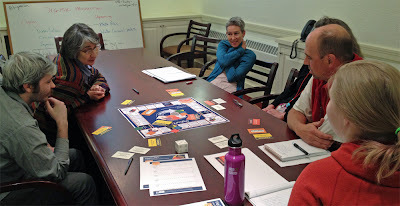 The game we played was Curate: The Digital Curator Game. This game was created by Digital Curator Vocational Education Europe, or DigCurV for short. 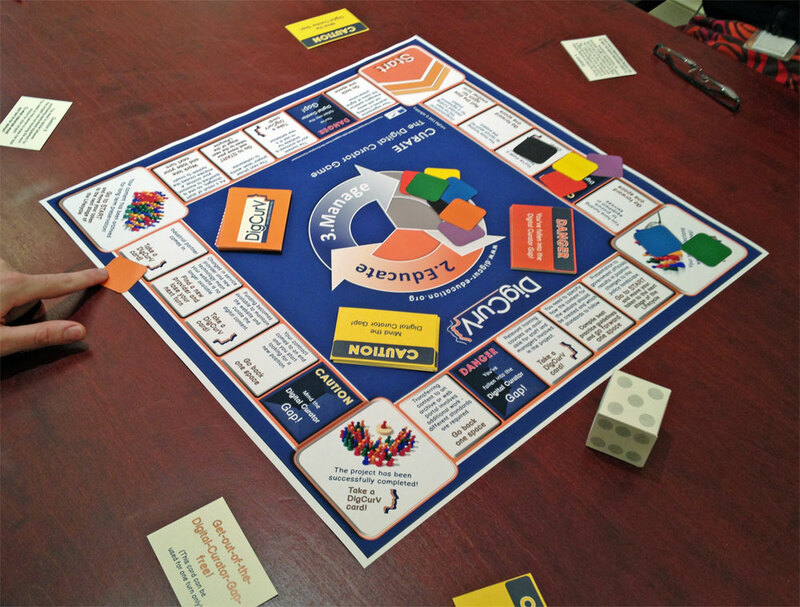 The game is designed to help people learn about and discuss the challenges and strategies involved in digital curation, while also having a lot of fun! It includes plenty of pertinent questions exploring issues such as staffing, funding, collaboration, and training. The "game" part of the game is really just a ruse...a way to get people interested in having the digital curation discussion, and it worked. We all got really into it, and had a lively conversation. Some of the topics that we found especially useful were: project and workflow planning, skills needed for staff involved in curation, and listing external resources for gathering more information about digital curation. The game is free to download from DigCurv, they just require you to register as a network member. Part of the game includes recording discussion points on a record sheet, and DigCurV’s only request is that anyone who plays the game submit these sheets anonymously, to help them better understand how the game is used and whether it’s helpful. It was definitely helpful for us, and we thank DigCurV for providing such an excellent resource for sharing and learning about digital curation!